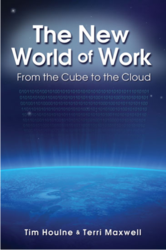 The new, eye-opening book, The New World of Work: From the Cube to the Cloud, is being featured in the University of Texas at Dallas (UTD) Bookstore with a special fifty percent discounted rate. Co-authors, Tim Houlne, CEO of Working Solutions, and Terri Maxwell, CEO of Succeed on Purpose, graduated from the UTD Executive MBA program in 2004 and are donating books to their alma mater to allow the deep discount, through February 22, 2013, at the UTD Bookstore. The New World of Work: From the Cube to the Cloud spotlights Virtualpreneurs™ as the new breed of knowledge professionals who will deliver a distinct competitive advantage for corporations and organizations to remain nimble and flexible to changing market conditions. The authors produced a video book trailer for The New World of Work: From the Cube to the Cloud.The video describes the transformation of work platforms and talent-sourcing that is revolutionizing not just how and where work is performed, but the way business is being done. The New World of Work: From the Cube to the Cloud is the new, eye-opening book that underscores startling statistics about the global labor force. The New World of Work provides the knowledge to propel careers and businesses forward with a better understanding of next-generation work by explaining how to become a Virtualpreneur™ and highlighting how businesses can compete for virtual talent. Learn more by visiting http://www.newworldofwork.com. To order the book, click here. With more than fifty years of combined leadership experience, Tim Houlne and Terri Maxwell stand at the forefront of a transformation reshaping everything we know about careers and talent strategies. Tim Houlne is a visionary whose longstanding, futuristic predictions about the virtual workforce are now a reality. He recognizes and understands market trends, and uses that unique knowledge to transform industries across the business landscape. His understanding of the virtual workplace is unparalleled, and his drive to uncover new concepts is matched only by his passion for growing profitable businesses. Tim holds the position of CEO at Working Solutions, a premier virtual agent and technology solutions provider in Dallas, Texas. Terri Maxwell provides game-changing insights to transform businesses, people, and industries. She is a powerful, passionate leader known for simplifying formulas for success and igniting potential. In a career spanning more than 20 years, Terri puts her talents to work for large and small companies, and is a well-known consultant to businesses and entrepreneurs seeking to accelerate growth. She built numerous successful companies and created an impressive and well-known business incubator, Succeed on Purpose Inc. in Irving, Texas.